Many people believe that solar power is too expensive to use for powering computer installations in remote or rural areas that are without a connection to the AC grid. However, there have been two recent developments that have significantly lowered the cost of solar. If you are thinking about deploying computers in remote rural locations or in countries with erratic grid power, the cost of reliable, long-term, low-maintenance power has never been lower. 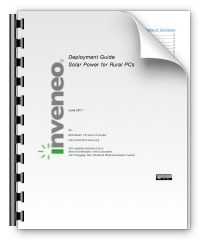 The Inveneo Solar Power Deployment Guide will show you how to specify, design and build your own small-scale self-contained solar power system. 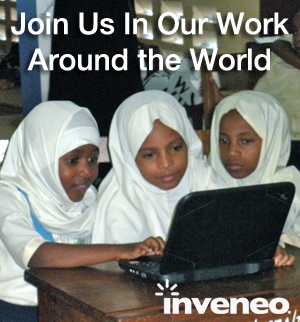 The guide’s purpose is not to make you a world-class expert on solar technology. Rather, we will take a “hands-on” approach, emphasizing a step-by-step method to designing and building truly practical solar systems. As there are a large number of “tricks of the trade” involved when installing a solar system, we do not usually recommend a do-it-yourself approach for beginners. It is better to work with an experienced solar installer, especially if you have never worked with solar or other power systems before. After reading this guide, you should be able to estimate the size, level of complexity and cost of small to medium- sized PC installations, and you will understand the basic theory and practice. This guide is focused on completely battery-operated PC and network installations. It does not discuss battery backup systems for generator- or AC- grid-powered locations.